What is the first thing that comes to your mind when you think of Hawaiʻi? Waikīkī? Diamond Head? White sandy beaches? How about lush green forests backdropped by stunning green mountains? Family vacation photography is a lot of fun because we are able to capture all of the fun of a vacation in a few photographs. Every time you see the photograph, fun memories from the vacation come to mind. And Hawaiʻi is unique in that there are a lot of great places to capture these fun family memories. The MacNeil's were excited to have their photos taken off the beach, somewhere fun that showcases a different side of Hawaiʻi. So I suggested one of my favorite spots in Kāneʻohe, a lush, green botanical garden with stunning views of the Koʻolau Mountains. The weather was gorgeous and even the water fowl came out to play. 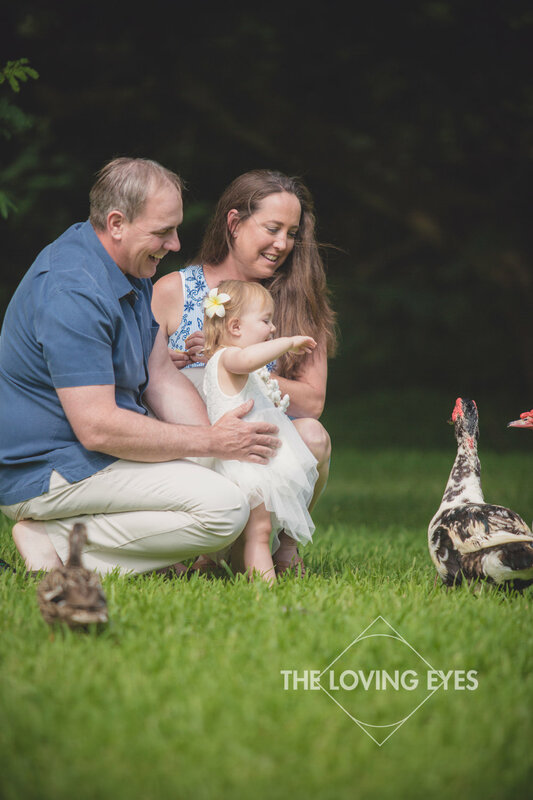 Ducks always make little children smile!